ATLANTA, GA and BOTHELL, WA, June 04, 2018 (GLOBE NEWSWIRE) -- Cocrystal Pharma, Inc. (NASDAQ: COCP), (“Cocrystal” or the “Company”), a clinical stage biotechnology company discovering and developing novel antiviral therapeutics that target the replication machinery of hepatitis viruses, influenza viruses and noroviruses, announced today that Dr. Gary Wilcox, Vice Chairman and Chief Executive Officer of Cocrystal, will ring the Nasdaq Stock Market Closing Bell on Wednesday, June 6, 2018. The bell ringing ceremony celebrates the Company’s recent uplisting to The Nasdaq Capital Market, the progress of its Phase 2a study of its lead product candidate, CC-31244, for the treatment of hepatitis C (HepC) as well as the progress of the influenza program. 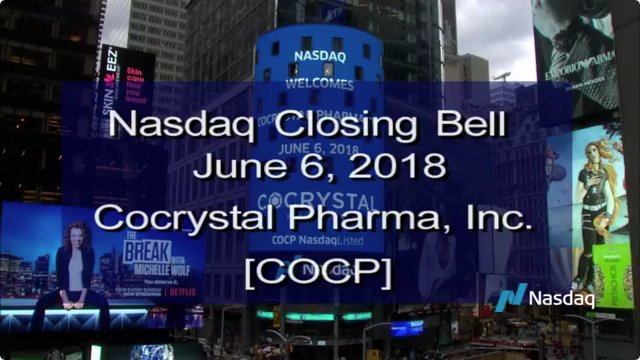 A live webcast of the ceremony will be available at: https://www.cocrystalpharma.com/news/multimedia-videos/video/349/nasdaq-bell-ringing-ceremony. The Company's executive management team, family members and other supporters will join in the ceremony. CC-31244, the Company’s lead product in development for HepC, is an investigational, oral, potent, broad-spectrum replication inhibitor called an NNI. It has a high barrier to drug resistance designed and developed using the Company's proprietary structure-based drug discovery technology. It is a highly potent, broad spectrum non-nucleoside inhibitor that is active against all genotypes (1-6). The Company recently announced that its Investigational New Drug (IND) application submitted to the FDA is now open and the Company is cleared to initiate its Phase 2a clinical study evaluating CC-31244 for the treatment of HepC-infected individuals. The Company expects to initiate patient enrollment and dosing in the Phase 2a study evaluating CC-31244 for the treatment of HepC this quarter. In addition to the Company’s HepC clinical program, Cocrystal is developing novel, broad spectrum influenza antivirals that are specifically designed to be effective against all strains of the influenza virus and to have a high barrier to resistance due to the way it targets the virus. CC-42344, its lead molecule, is a highly potent PB2 inhibitor and shows a favorable pharmacokinetic and safety profile. The lead candidate for influenza has advanced to IND-enabling studies. Nasdaq is a leading provider of trading, clearing, exchange technology, listing, information and public company services across six continents. Through its diverse portfolio of solutions, Nasdaq enables clients to plan, optimize and execute their business vision with confidence, using proven technologies that provide transparency and insight for navigating today's global capital markets. As the creator of the world's first electronic stock market, its technology powers more than 85 marketplaces in 50 countries, and 1 in 10 of the world's securities transactions. Nasdaq is home to approximately 3,800 listed companies with a market value of $10.1 trillion and nearly 18,000 corporate clients. To learn more, visit: business.nasdaq.com. This press release contains forward-looking statements within the meaning of the Private Securities Litigation Reform Act of 1995, including our expectations regarding the commencement of the Phase 2a study for our Hepatis C product. The words "believe," "may," "estimate," "continue," "anticipate," "intend," "should," "plan," "could," "target," "potential," "is likely," "will," "expect" and similar expressions, as they relate to us, are intended to identify forward-looking statements. We have based these forward-looking statements largely on our current expectations and projections about future events. Some or all of the events anticipated by these forward-looking statements may not occur. Important factors that could cause actual results to differ from those in the forward-looking statements include the availability of products manufactured by third parties, the ability of the clinical research organization conducting studies to recruit subjects and obtaining regulatory clearance. Further information on our risk factors is contained in our filings with the SEC, including the Prospectus Supplement dated April 30, 2018, and our Annual Report on Form 10-K for the year ended December 31, 2017. Any forward-looking statement made by us herein speaks only as of the date on which it is made. Factors or events that could cause our actual results to differ may emerge from time to time, and it is not possible for us to predict all of them. We undertake no obligation to publicly update any forward-looking statement, whether as a result of new information, future developments or otherwise, except as may be required by law.